afrol News / SANF, 8 December - Africa and Europe have agreed on a new plan of action aimed at strengthening relations between the two continents. 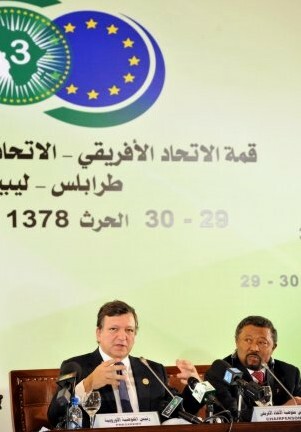 The Action Plan 2011-2013 was adopted at the recent Africa-EU Summit held in Tripoli, Libya. It replaces the First Action Plan 2008-2010 that was approved at the last summit three years ago. Both plans of action are based on eight partnerships defined as "strategic". These focus on energy, climate change, peace and security, Millennium Development Goals (MDGs), trade and infrastructure, among other sectors. Under energy, Europe and Africa aim to improve access to reliable, affordable, cost-effective, climate friendly and sustainable energy services for both continents, with a special focus on achieving the MDGs in Africa. This would be done by building 10,000 Megawatts (MW) of new hydro-power facilities in Africa, at least 5,000 MW of wind power and 500 MW for all forms of solar energy by the year 2020. Africa and Europe also plan to double the capacity of cross border electricity interconnections, both within Africa and between Africa and Europe, thus increasing trade in electricity while ensuring adequate levels of generation capacity. With regard to infrastructure, an agreement was made to pursue priority regional and continental-level infrastructure for increased interconnectivity through continued project development, reinforced coordination and advocacy for backbone infrastructure. Towards the Millennium Development Goals, leaders from the two continents pledged to speed up the implementation of agreed goals by 2015 through increased European funding. On trade, Europe pledged to further open its market to African products and promote small to medium enterprise development. In respect of peace and security, an agreement was reached to jointly contribute to the global security governance in Africa, Europe and world-wide, and make the dialogue more effective. The summit also agreed to strengthen the capacity of the African Union, regional, national institutions and public authorities in the field of election organisation or observation and of civil society and media in election observation. According to the recent review report of the First Action Plan, steady progress was found to have been made in the implementation of agreed goals, particularly in areas of energy development, MDGs and regional integration. However, leaders called for more coordination among member states to ensure that the new Action Plan is a success. African leaders also said the two continents should cooperate on an equal footing to promote mutual understanding and respect. AU deputy chairman, President Ali Bongo of Gabon, said Africa and Europe have the capacity to address most of their socio-economic challenges if both continents work together. "We have all agreed that our partnership is not just about what Europe can do for Africa or vice-versa, but about what we can do together," President Bongo said, adding that Africa had a huge untapped resource base that could be harnessed if Europe is willing to partner with the continent. "I believe that if we remain together, we can achieve great progress for the benefits of our peoples," President Bongo said. His South African counterpart, Jacob Zuma, concurred and said Africa was ready to work with Europe. "This partnership can demonstrate to the world, including other partners in Africa, what can be achieved when we work together to support initiatives that are led and owned by Africa," he said, adding that "our people both in Africa and Europe look up to us for this partnership to grow our economies and create decent jobs." The host of the conference, Libyan leader Muammar Gaddafi, said that, "We want a win-win relationship based on mutual interest and not on exploitation. Africa and Europe need each other." Mr Gaddafi added that if Europe did not engage in a partnership with Africa on a footing of equality, then Africa may consider other options such as China, India or South America. His sentiment was echoed by the AU Commission chairman, Jean Ping, who stressed that the continent requires an equal voice with its partners. European Commission President, Jose Manuel Barroso, also said Africa was an important partner for Europe and the two need each other. He noted that, even though Africa is expanding its economic relations with other continents, Europe remains its top trading partner. A total of 80 African and European leaders attended the 3rd Africa-Europe Summit held on 29-30 November, which ran under the theme "Investment, Economic Growth and Job Creation". Africa and Europe held their first summit in Egypt in 2000 while the second was hosted seven years later in Portugal. Seven years elapsed without any summit due to various challenges. However, at the summit in Portugal, the leaders of Africa and Europe agreed to meet every three years. Belgium is expected to host the next summit in 2013.